With cannabis banking still being illegal on the Federal level even after California has issued hundreds of temporary legal licenses, HARDCAR Distribution provides its clients secure solutions for keeping their money safe. March 1, 2018 – (Palm Springs, CA) – HARDCAR Distribution has partnered with Cannabis Cash Solutions to introduce Smart Cash Deposit Vaults, offering business owner’s peace of mind throughout California’s flourishing cannabis market. Licensed companies can now secure their cash without the need for safe combinations or keys, and swappable cash cartridges make it easy to access cash when it’s time for transport. This turnkey cash management system makes it easy to protect investments, with HARDCAR monitoring the vaults and then scheduling timely pickups by their armored vehicles, which are manned by tactically trained Military Veterans. The absence of banking for cannabis companies has left the industry reliant on cash, increasing public safety risks. HARDCAR’s security solutions have proven to be the safest method of transferring money. Although California went legal on recreational marijuana on Jan. 1, 2018 and there have been hundreds of temporary licenses handed out, there is a lot of money being held without any Federally legalized place to put it. This puts legal businesses in the The Golden State at serious risk and automated cash handling systems can prevent robberies and increase safety. 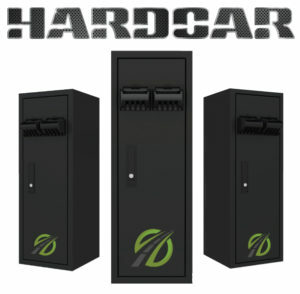 HARDCAR Distribution’s Advanced Smart Safes act as automated cashiers, taking over cash handling responsibilities from cashiers/bud tenders so they can focus on customer service and sales. The Dual CashCode bulk note loaders support from 6,000 to 24,000 notes by chaining multiple vaults (more chains can be added if needed). Users simply place a stack of bank notes in the loader at one time rather than feeding them in one by one, with the system automatically rejecting counterfeit notes. While California State Treasurer John Chiang leads efforts to reform the state’s current cannabis banking system by establishing its own public system, there remains a major gap and HARDCAR’s security solutions are the best options in the interim. By depositing cash in protected and monitored smart safes, customers and employees are safer with cash management systems in place. BDS Analytics estimates that sales of both medical and recreational cannabis could hit $3.7B in 2018, and that number could easily increase to $5.1B in 2019 as more dispensaries come online. California is the world’s sixth largest economy with a population of 36+ million people, so it’s safe to say that the cannabis industry will continue to evolve with HARDCAR as a leader in the safe and secure protection of both cash and product.